at Posted at 16:55h by Published by Rhett . 0 Comments . Todays Upper Green River Fishing Report leaves me blown away at how drastic the changes have been recently. Last week at this time it was snowing and blowing and today there’s not a cloud in the sky and the high temp is gonna be 80. For the folks who follow these reports it’s obvious i like to use data and charts to illustrate what’s happening on the rivers. When you look at the chart at the top you can see just how high the flows we’re up until now. The flows were 2-3 times the 30 year average which means the month of July looks to be great and after that we’ll just have to see. But the good news is that most of this water gets captured at the Fontenelle Dam, which is the first dam on the Green River and is an amazing tailwater fishery! Meanwhile we saw some off color water yesterday from a few rogue storms that dumped their load on the Wind River Mountains where the Upper Green River is born. It’s important to remember that there is no dam on the upper reaches so we’re at the mercy of mother nature. There have been some stones, mayflies and caddis dancing around and it seems as though the trout will start looking up soon for the surface bite. We have guides out all over now so please give us a holler @ 307-413-0669 for the latest report and/or to book your trip or email; [email protected]. The time has come for another fantastic season on the Upper Green River! Be safe out there! at Posted at 23:07h by Published by Rhett . 0 Comments . The updated Upper Green River Fishing Report is WE’RE BACK IN BUSINESS! Please call us for the latest and greatest @ 307-413-0669 or email; [email protected]. at Posted at 14:50h by Published by Rhett . 0 Comments . at Posted at 18:50h by Published by Rhett . 0 Comments . Our Upper Green River Fishing Report today is we’ve started to guide on the Upper Green River just the past several days now that the flows have slowed down. What comes up must go down, at some point! The flows have been 2 to 3 times the 30 year average so as you can see the charts below, it’s really tricky predicting what, when, why and how since there is not a dam on the Upper Green River. Not having a dam has positives and negatives, but there sure are more positives than negatives, thankfully. The water is still very cold, so nymphing a turd and a worm under an indicator between 8-9ft has been producing the best and most consistent results. There’s caddis out in the late afternoon and into the evening and the fish haven’t keyed into them just yet. We’re looking forward to seeing the golden stones and drakes in the next few weeks. Please call 307-413-0669 to get the most up to date info or email; [email protected]. We hope to get you out for a great day on the water! at Posted at 21:02h by Published by Rhett . 0 Comments . The Upper Green River Fishing Report is still an update with the flows on the increase after all of the recent rains and the temps not hitting the freezing mark. The fishing up near the headwaters is clear but still trying to get rolling with the water temps that are still really cold. Check out the chart below that shows the flows running 2-3 times the average for 45 days now. SO, we’ll see what happens this week as the sun breaks out and the temps get near 80 several times this week. Once the flows do recede we’re ready for some great action with the golden stone and drakes! at Posted at 21:57h by Published by Rhett . 0 Comments . The Upper Green River Fishing Report is still an update at this point, although it won’t be too much longer for prime time fishing. The only concern at this point is how or when the high elevation snow breaks free when the temps being to increase again over the holiday weekend. We have trips out in the region so we’ll see how this plays out. Looking at the two graphs below you can see how high the flows have been which is dictating when we’ll be getting on the river to start guiding. I’m of the mind that barring any crazy weather events we’re gonna start guiding on the upper reaches of the Green River within the next 10 days. As you can see in the graph below the Green River flows have been running super high now for the past 5 weeks. This info is from the Warren Bridge station which is located at hwy 191/189. at Posted at 19:44h by Published by Rhett . 0 Comments . The Upper Green River Fishing Report in Pinedale Wyoming is still more of an update. The flows are just about to go off the chart as you can see below. It’s been unseasonably warm and we’re looking at rain for the next few days. With no dam on this river what we get is what we get so stay tuned. Here’s the latest flow prediction that we’re looking at when considering when we’ll get on the water. At this point we’re about to head up to the upper reaches soon as soon as the road permits. at Posted at 19:46h by Published by Rhett . 0 Comments . The Upper Green River Wyoming Fishing Update is a huge runoff due to some unseasonably high temps during the days and no freezing in the nights the past few nights in a row.Here in lies why predicting a start date requires an algorithm which is exponentially complex. Check out the charts below which help illustrate what i’m trying to articulate. We’re still planning to guide on the Upper stretches near the Green River Lakes thanks to our relationship with Black Diamond Outfitting in early June and will start to move down once the runoff subsides. In the meantime, please feel free to reach out to book your trip and/or get the latest and greatest. Email; [email protected] or call 307-413-0669.
at Posted at 15:00h by Published by Rhett . 0 Comments . PLEASE CALL 307-413-0669 TO GET THE MOST UP TO DATE UPPER GREEN RIVER FISHING REPORT. THANK YOU. at Posted at 20:17h by Published by Rhett . 0 Comments . First trout on a fly! FINALLY, we have a positive and productive Upper Green River Fishing Report to share! The Grey Drakes are in full force as are the pmds, sallies, goldens and caddis as well. As the weeks temps get warmer getting out earlier on the water will afford you a better and more realistic opportunity of catching the hatch. The fish are just starting to inhabit the banks, sticking in tight to the pockets. Look for the fish to be feeding in the slower seams, side channels and eddys. On the brighter days be careful of the shadows from your rod and lines spooking the trout and turning them off the feed. False casting too many times is yet another way to spooking the trout as well. During the hot afternoons dont hesitate to put on a dropper to keep the action going. The water supply is really looking good for the remainder of the season on the Upper Green River and we’re booking clear into October! For the most up to date information and/or to book your trip please call us @ 307-413-0669 or email; [email protected]. at Posted at 21:26h by Published by Rhett . 0 Comments . 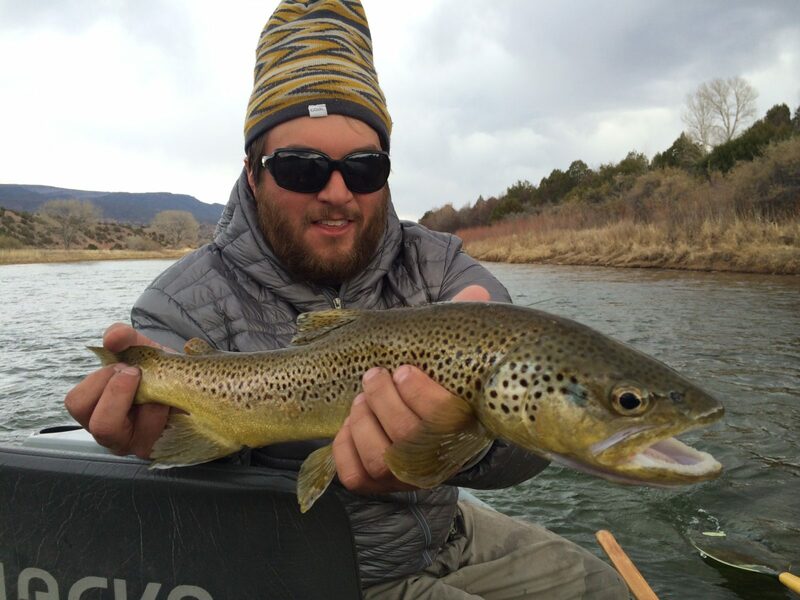 Our most current Upper Green River Fishing Report is now becoming a true fishing report. It is a true miracle that we’re even discussing the possibility of fishing considering the huge amount of snowpack that was up in the mountains from the winter. It is VERY IMPORTANT to consider that this water shed has no dam until mile 170 so what we get, ALL depends on the natural elements. Yesterday, we floated up in the forest, towards the headwaters and although the water is still running quite fast, we were able to find some fish that were willing to eat either a streamer, nymph or a dry fly. We saw several golden stones and a ton of caddis and the surface water is still chilly; hovering around 50 at mid day. You can see the 3 separate surges on the graph below that melted a ton of snow over the spring, which is the only reason why we’re headed into the summer fishing season this week. Make no mistake, the water is still running swiftly and it’s gonna take more time for it to settle down, but there’s opportunity for some good and challenging angling opportunities to be had. After spending the winter in Texas it is so nice to be back in Wyoming. ESPECIALLY with the copious amount of water. The Upper Green River Valley is a very special place and yesterday I caught myself just sitting in the back of the boat, listening to the water run past and feeling like I’ve died and gone to heaven. Speaking of, The Upper Green River is heaven on earth! Look for Golden Stones to make their appearance soon, which we’re all super excited about seeing! To book your fishing trip, or just call to get the latest, please call us @ 307-413-0669 or email; [email protected]. at Posted at 22:21h by Published by Rhett . 0 Comments . This Green River Fishing Report is still a flow report and update. The Upper Green River near Warren Bridge has been dropping steadily with the cooler temps over the week. We’re anticipating another surge of high water once the snow up high gets hit with the warming trend forecasted to start on Monday. Check out the 2 prior surges and the predicted flows, hence why it’s so complicated to determine when the flows will settle down and quality fishing starts to be consistent. Upper Green River Flows, past and present. Once the warming trend commences, we will have a better idea of when we will be out guiding on this wonderful river. Please call us @ 307-413-0669 or email [email protected] to book your trip for this summer/fall fishing season. at Posted at 16:53h by Published by Rhett . 0 Comments . The Upper Green River Fishing Report today is a snowpack update. Check out the graphs below which show just how much snow is still up in the high country. The area rivers are all at or above flood stage currently and we hope that the cooler temps next week will help the waters to recede. Our plan at the moment is still getting out on the Green River around late June. We are currently taking reservations through October this year so take advantage of the extended season this year! Give us a call @ 307-413-0669 or email; [email protected]. For the latest check out our Upper Green River Fishing Report. Take care and tight lines. at Posted at 21:07h by Published by Rhett . 0 Comments . Currently the Upper Green River Fishing Report is HUGE WATER on most of the area rivers, creeks and streams. The best news is we have several lakes, rivers and creeks to float and/or wade on and are fishing well and are great options when you’re ready to get out and fish. Other good news is typically after a huge runoffs the hatches can be enormously prolific once the waters calm down. We’re trying to start adding in a video report and here’s my first attempt. Green River Basin and Upper Green River Basin Foothills. expected to rise to near 9.2 feet (13,000 cfs) by Monday afternoon. Currently our best guess is that we’ll be guiding on the Green below the Forest and New Forks Rivers around late June. Please give us a call @ 307-413-0669 or email [email protected] to get your trip booked or to get the latest and greatest information. Take care and tight lines! at Posted at 16:06h by Published by Rhett . 0 Comments . Upper Green River Fishing Report: This will serve more as a water flow update than a fishing report. Currently, the flows have subsided once again with the cold snap thats forecasted through tomorrow. After Monday, look for the flows to increase once more and we will see exactly how high they will get. One of the outfitters we work with on our pack trips is going to attempt to get up into the high country in a week or so, and we’ll have a much better idea when that happens. It’s interesting to note on the graph below on how the prediction was so off from the actual over the past week. Given this info we’re planning to start guiding the last week of June and perhaps a week prior to the on the Upper Green River. We’re looking forward to a great season of fishing and hope you will consider us for your fishing outfitter. To book your trip or to get the latest info please give us a call @ 307-413-0669 or email; [email protected]. at Posted at 16:57h by Published by Rhett . 0 Comments . It looks as though the spring runoff will kick into high gear finally for the Upper Green River Basin in Wyoming! As you can see by the graphs below the flows have already been well above average for awhile now. The lower you go downriver on the Green expect to see flooding if the melt is accelerated. When you look at the map below you can see there is a ton of snow up in the high country so we’ll see how it all plays out the next 45-60 days. Our plan, based on the most current science, logic and personal observation will be to guide on Soda Lake until more options become available. We’re thinking that we’ll start to guide on the upper sections of the Green River come late June and depending on the flows, being out on the upper New Fork as well. Once the water settles down we’re looking forward to another great season! at Posted at 20:25h by Published by Rhett . 0 Comments . Howdy folks! We are getting so many reservation and information requests for our Green River trips I thought i’d try to substantiate the most current information we know and share. The snowpack that supplies water for the Upper Green River in Wyoming is currently at 170% of a 30 year average. WOW! What does this mean? Well, at this point it’s anybody’s guess. The information below in the various graphs are the most reliable and scientific information available that i’m aware of. Looking at the graph below the peak runoff will occur somewhere between mid to late June. BUT, one must remember we have a LONG WAY to go! With that being said, having a big runoff is very beneficial to the river and ecosystem, which we’re very excited about! I will try to keep this report updated monthly until the spring thaw begins, then we’ll update it much more often. We’re looking forward to a great season and please give us a holler or email to book your trip or get the latest. Our contact info is 307-739-7020 or [email protected]. Take care and tight lines! at Posted at 15:44h by Published by Rhett . 0 Comments . The Snowpack, thus far, is looking great in Wyoming, especially in the Upper Green River watershed. Currently it’s sitting at 160% of a 30 year average. What’s really important to know is we still have a way to go before the fishing season begins, but we’re off to a great start. Let’s hope it continues to stay cool and snow! We’re currently booking for the 2017 season so give us a holler to book your trip or feel free to check in for updates as well. Our number is 307-739-7020.
at Posted at 20:00h by Published by Rhett . 0 Comments . TEMPERATURES WILL BRIEFLY RANGE FROM 28 TO AROUND 34 BY SUNRISE. at Posted at 22:12h by Published by Rhett . 0 Comments . 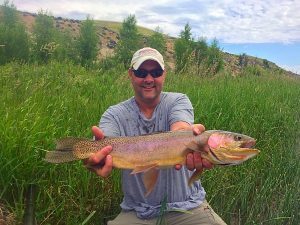 Green River Fishing Report for Pinedale, Wyoming; Like many other outdoor industries that are at the mercy of Mother Nature, the fishing industry in Western Wyoming has not had much of a break so far. We’ve seen a dramatic influxes of temperatures, fluctuating water levels and high winds that have been trying us for some time now. All that being said; the bite has been amazing in the Green River drainage since runoff subsided.We’re seeing grey and green drakes, pmds, caddis, yellow sallies and even blue wings too over the past few days. We are beginning to see the long term results of high temperatures that hit in the early Spring that caused an excess of the snow pack that feeds the Green River tributaries to melt earlier than anticipated. With water levels running only at 20% of the seasonal average, we will continue to be fishing/guiding the Upper Green River until the end of the month. With any luck, summer storms coming through the area will provide for water levels to rise and sustain quality fishing into August and into the fall. A cold front that has lingered from the weekend has pushed back early morning start times to mid morning when the fish begin to feed. Cold water temps have proved that a nymph dropper from a large foam pattern is the way to go to entice hungry trout from their resting places until the dry fly bite starts. Even with water levels dropping, the lower part of the river is controlled by the Fontenelle Dam, allowing our clients to successfully fish the waters of the Green River well into the end of our fishing season. The bite there has been amazing and we foresee that trend to continue. To book your trip please call us @ 307-739-7020. Tight lines and happy days! at Posted at 2:55h by Published by Rhett . 0 Comments . Happy Fathers Day! Enjoy your weekend and be safe! Them roads out there are wild and crazy!!! The Upper Green River Fishing Report today is the flows are coming down, the clarity is slowly improving and we’re seeing some good action on streamers, nymphs and a few dries. We’ll see if the hot temps forecasted this week melts some of the higher elevation snows, which might color up the water once again. The past few days have been improving for yields and quantity. For an up to date report, please call us @ 307-739-7020.
at Posted at 15:07h by Published by Rhett . 0 Comments . The Upper Green River has been experiencing a huge roller coaster ride with the flows the past several weeks. My guess is that the runoff has peaked and now that the temps have cooled off we should see a slight decrease in flows over the next week. the water temps are super cold so we’ll see what the week brings us. For the most up to date information, please call us @ 307-739-7020. Based on the predicted flows below, we’re looking really good for a great summer season. We have a few choice slots available for the month of July left, so give us a holler. at Posted at 19:12h by Published by Rhett . 0 Comments . On Friday we had a training run out and the guides had some great luck with some large fish. Not too many in the net, but those who made it in, were dandys. As soon as they were getting off another spring storm rolled in. And then on Saturday, one of our new hires, Austin got out on the Green River and it hailed so hard on him he had to duck and cover. Not to long after a full on blizzard moved in. So, the river swells to double its flow in 2 days, which throws the river off and we will see what happens from there. There are new storms rolling through as I write, so please give us a shout @ 307-739-7020. The snowpack is still hovering around 80% which is really solid considering that we’ve had several warm spells. Gotta go to know………The Green River has been fluctuating like crazy the past several weeks due to the extreme temperature swings. Today the flows are pretty darn close to the 30 year average, which will make for an interesting week. Keep in mind this is runoff season so take that with several grains of salt. The water has a slight tinge to it and we expect it to get darker as the temps warm up this week. The bite has been best from mid to late afternoon on a double nymph rig and we refer to the rig as a turd and a worm. Keep your setup short as the fish are close to the banks and in pockets out of the highest flows. The streamer bite has been good too with a sink tip and natural colors have been the ticket. We’re not seeing double digit numbers but seeing a few decent fish on each outing. To book your trip give us a call @ 307-739-7020. Thanks and tight lines! at Posted at 19:36h by Published by Rhett . 0 Comments . The Upper Green River over the past few days has seen a wild swing of weather. Last Thursday, May 5th, it was wet wade warm and then less than 24 hours later it rained around 3 inches, then Saturday we had full on blizzard conditions. The, last night it rained again. Ah, spring time in the Rockies. So, the river is high and off color and will more than likely be so for awhile. BUT, with these extreme weather swings, who knows! Please contact us to get the daily update on conditions. The current snowpack is sitting at 77%, which should bring good flows through the summer. Our current plans are to guide on the Upper Green River, from the Green River Lakes down to where the first tributary, the Roaring Fork, comes into the Upper Green River. Our Upper Green River trips are through Black Diamond Outfitters. The Upper Green River is truly God’s country and we’re super excited about getting our valued clients out on the water this season. You ALWAYS have the opportunity to catch the fish of your lifetime in this area. As the snow melts and the middle reaches settle down and clear, we will progressively move our guiding operation downstream. The streamflow prediction is below. at Posted at 12:34h by Published by Rhett . 0 Comments . Currently we’re seeing great hatches on the Green River and the fish are really keyed in on them. There have been pockets of drakes, sallies, caddis and pmds. Depending on the day, time and temperatures we’ve seen any and all of the aforementioned. Heck, we even had blue winged olives last Wednesday when it was cool and rainy. On the warmer afternoons putting a dropper on can keep the action going. Look for the waters to fluctuate if the storm predicted for later today through Friday comes to fruition. at Posted at 1:22h by Published by Rhett . 0 Comments . at Posted at 20:18h by Published by Rhett . 0 Comments . Thank God for the cloud cover and rain today that was really needed on the Upper Green River! Let’s hope and pray it continues. The name of the game for the past 2 weeks has been early bird but with the cloud cover the action should start to elongate through the better part of the day. The drakes are still the predominate hatch but we’re still seeing goldens as well. The Pmd’s, yellow sallies and caddis are really consistent too. Look for the bigger fish in the tight pockets grassy banks and tailouts. at Posted at 14:20h by Published by Rhett . 0 Comments . The early bird gets the fish on the Green River……we’re in a heat spell currently and the surface action has been great from around 8am to 1-2pm then slows way down until early evening. We’re seeing lots of grey drakes, meaty yellow sallies and some nice pmd’s too. Dropping a bead head in the afternoon can still produce a few fish too. Getting your fly in the tight spots, with drag free drift in the name of the game for the bigger fish. at Posted at 20:29h by Published by Rhett . 0 Comments . The 2015 summer season has officially kicked off and here’s our latest Green River Fishing Report in Pinedale Wyoming. This past week the flows have been returning to normal and are shaping up quite nicely. The Golden stones are the most predominant hatch right now but there’s plenty of yellow sallies, a few drakes and caddis in the evenings. We’re seeing a warming trend over the next 10 days so the early bird gets the worm! We are starting to guide on the private ranch access so please give a shout if you want to rid your self of the summer crowds. The flows on the Green River are starting to diminish and we’re thinking the next few days should get enough clarity to get back out there and give ’em heck! The Golden stones should be poppoing any day now. We’ll be on the Green and New Fork every day this week so we’ll report back around the end of the week. at Posted at 20:20h by Published by Rhett . 0 Comments . The Upper Green River was blown out last week and we’re not sure which direction it’s headed this week with the warmer temps. The bite yesterday was most productive nymphing worms and stones and caught a few on streamers too. Look for the flows to increase until mid week and we’ll see what happens with the storms predicted for Wednesday and Thursday. The upper reaches near the lake were flooded on Saturday. at Posted at 22:19h by Published by Rhett . 0 Comments . The Flows today are 969 CFS at Warren Bridge on the upper green river wyoming and we expect them to start rising as the temps start to warm up this weekend. See chart below. The water is still pretty darn clear for the moment but we expect that to change soon as well. There is a huge snowpack up in the mountains once again and we’re hoping it starts to filter down any day now. The bite has still been good on streamers mostly but nymphing a turd and a worm has been productive as well along with a caddis pupa too. The rains in the afternoons have been washing a lot of worms into the water and the fish are gorged with the them. at Posted at 21:34h by Published by Rhett . 0 Comments . The Upper Green River is still pretty frozen up (see pic below) still but the lower below the Fontenelle Dam is fishing well and wide open. If the wacko warm temps that we’re currently experiencing persist, we’re planning on getting out on the Upper Green some time in late April or early May. Stay tuned to the updates here or give us a call to get the latest and most current conditions. Our number is 307.739.7020. The fishing report from the Upper Green River Pinedale Wyoming is the river is still fishing well and the flows are still at a rate where the river is still floatable. The fish are eating hoppers, caddis and tricos and are really keyed in on each hatch. Being the weather is still continuing to fluctuate, there’s been no consistent given time frame on the hatches during the day. With that being said, the best action has been mid morning till mid afternoon and late evening till dark. The curent forecast show the temps cooling off and the cloud cover is a HUGE bonus! Check out this trophy Brown landed the other day on a terrestrial pattern. at Posted at 17:15h by Published by Rhett . 0 Comments . For the moment the rains have subsided and the river flows are receding and have cleared, once again. As you can see by this graph the rains have pumped a lot more water into the system which is only making the fishing better for the duration of the season. The fish are still looking up at Terrestrial, Trico and PMD’s and the bite has been much better in the morning and evening and somewhat dormant throughout the afternoons. Look for this trend to continue for the next week or so. The long range forecast shows the first overnight freeze occurring about 10 days from now which should shake things up a bit in terms of the bite so stay tuned for the follow up report. at Posted at 14:42h by Published by Rhett . 0 Comments . The Upper Green River Fly Fishing Report over the past week has been yet another roller coaster ride with the crazy swings in air and water temps. The flows have definitely come down to the 30 year average flows which makes the water more “user friendly”. We have seen drakes, green and grey, pmds. mahoganies, baetis, flying ants, beetles and hoppers. We’ve been guiding up and down the 160 miles that we’re permitted on and overall the action has been amazing! During the warmer days we’re putting on the river by 7am and getting off around 2pm then floating the evening hatch from 6-9pm. the past few days we’re seeing great surface action the entire day with the cooler temps, clouds and rain. We have yet to encounter many other people which only makes the experience that much better. Our clients are catching nice fish on each and every trip, all still on dry flies. at Posted at 23:20h by Published by Rhett . 0 Comments . Gotta go to know! The reason I mention this is that Thursday on the Upper Green River was arguably one of the best days of dry fly fishing for huge trout i’ve ever seen, ANYWHERE ON THE PLANET! Then, we go back yesterday and it was good fishing but not even close to what we experienced the day before. There were so many fish over 20″ sipping spinners all day long that we almost had to spend the night. The Grey Drakes and PMDS have been quite plentiful and the fish and certainly keyed in on them. Each day has proven to be different action at different times due to the water flows waning back to “normal” flows. One has to remember that this time last year the Green and New Fork were borderline unfloatable and in some places almost stopped flowing completely in mid August. What a difference the snow and rain makes! Thankfully, the moisture gods have been smiling upon our region, which is making for epic days on the river. Speaking of moisture, there was such a huge storm pass through the region on Tuesday evening the fishing/catching throughout western Wyoming was pretty much non-existent on Wednesday. Gotta go to know!!! at Posted at 22:37h by Published by Rhett . 0 Comments . Upper Green River Fly Fishing Report for Pinedale Wyoming. This past week we’re still seeing much higher than “normal” and/or “average” flows. The temps from Sat 7/5 through 7/9 hit a high of 90 which slowed the catching down some but now that the afternoon t-storms cycle has re-started we’re seeing the epic Grey Drake hatches kick in to high gear. The bite has been from 9am to late afternoon and it’s only going to get better as these cloudy days persist. Every day the pattern de jour has changed from the duns to emergers to the spinners. In some areas the pmd’s are really starting to come off as well. As for the golden stones it appears as if they’re waning now. The past 3 out of 4 days I’ve guided clients on 60 miles of river and we saw 1 boat total, so, If you’re looking to get away from the crowds and on some killer trout give us a shout to book your trip. Our Professional Green River Fly Fishing Guides are currently licensed to guide on 160 miles of the Green and New Fork Rivers. 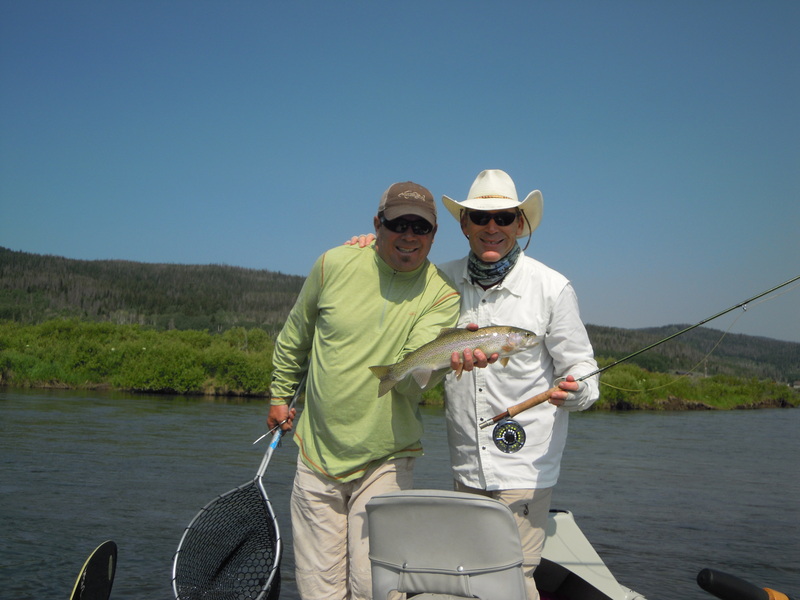 Our booking number is 307.739.7020 we’d love to show just how special Wyoming Fly Fishing is! at Posted at 13:39h by Published by Rhett . 0 Comments . The Upper Green River Pinedale Wyoming Fly Fishing Report is the flows are back to being steady and the water temps are warming up to the mid 50’s. As the old saying goes “the fruit is ripe for picking”. The action has been from mid day to late evening and should start even earlier as the temps warm up. We’re seeing the Grey Drakes and PMD’s getting more substancial every day and the golden stones are still prevalent on most areas on the mid to upper reaches. The fish have been keyed in on the emergers on some stretches and spinners on others and adult duns on others. Yesterday we floated above Warren Bridge and had fish eating dry flies all afternoon and evening. We had the quad species day yesterday landing browns, rainbows, cutties and brookies. Enjoy your 4th weekend and get out there and enjoy the out of doors! If you’re wanting to get in on the best of the west call us for some incredible opportunities on our private accesses and get away from the crowds! To book your slot please call 307.739.7020! at Posted at 14:19h by Published by Rhett . 0 Comments . So the roller coaster ride is still happening with the flows! We’ve had some enormous storms in the area over the past week which had only added to the unpredictable runoff given all factors to be considered. The Green and New Fork Rivers are currently rising and are forecasted to level out at the current flows over the next week, per the NOAA Green River Runoff forecast. The fishing/catching the past week has still been productive and plentiful. The fish are eating the Golden Stones on the surface, the classic turd and a worm for the subsurface setup with plenty of spit shot and the streamer action has been best on the JJ’s special or a pattern similar in a golden or yellow color using a 250 grain sinking line. at Posted at 3:39h by Published by Rhett . 0 Comments . Last week we were on the water mid week with a wintery mix freezing and several days later we were wet wading. If that doesn’t sum up the wacky runoff then nothing will. The colder temps have really cleared the river for the time being and the caddis and salmon flies have been out in swarms with the fish really keyed in on them. Yesterday we had fish up on the salmon fly all day long consistently. When I looked up the Upper Green River prediction from NOAA they’re showing another resurge of runoff so we’re going to wait and see what happens. Please see the chart below. It’s going to be day to day at this point for the Upper Green River Fly Fishing Report. Stay tuned……. This is a great view of the Wind River Mountain Range on the Green River! We are now booking our private access on the Green and have just a few slots left so please give us a call @ 307.413.0669. The salmon flies are out and will be followed by the Golden Stones and then the Grey Drakes!!! at Posted at 0:47h by Published by Rhett . 0 Comments . Hmmmm, well it was 36 degrees yesterday at Warren Bridge and blowing 20-25, with a “wintery mix.” The fishing was really hot, which kept us motivated until the clients couldn’t hold the rods any longer. The two young men who were out with their parents we’re very well behaved, polite and courteous and were a pleasure to fish with. KUDOS to their parents for doing a great job raising them. Anywho, the river is pretty darn clear right now but we’re expecting to see the snow that’s been falling on the mountains for the past few days to come down once it warms up over the next few days, which may muck up the water clarity. The flows have also come down to a reasonable level as well. We’re seeing bwo’s the past few days. Prior to that we’ve seen a lot of caddis on the warmer afternoons along with some salmon flies as well. The bite has been from mid morning to late afternoon with the most productive method being sub surface with either a stonefly/san juan worm set up or streamers in either white or black. The fish are really moving around with the flows fluctuating so much but have typically been located in the drop offs and pockets where the flows are reduced. at Posted at 20:03h by Published by Rhett . 0 Comments . There is still a huge amount of snow to melt still; as of today the 30 year average of moisture is 276%, which is mind boggling. That being said looking at the chart below from NOAA the flows at Warren Bridge are still double of the 30 year average and the flows above Fontenelle Reservoir are just about a flood stage, currently. We are planning to start guiding the lower reaches around late June, hopefully. Stay tuned for updates. at Posted at 19:35h by Published by Rhett . 0 Comments . The Green river is totally blown out and running twice the flow of the 30 year average. See the flow chart from the USGS and the photo below, which shows the water getting close to being bank full. This weekends temps should bring a lot of snow down and we’re hoping the water stays within its banks. RDA is starting to guide trips on the Upper reaches of the Green River in mid June and we’ve only got a few slots left. Please call 307.739.7020 to book your trip or get the latest information. at Posted at 18:44h by Published by Rhett . 0 Comments . The current Green River Fly Fishing Report Wyoming is the flows are double that of the normal 30 year average currently. The snowpack up in the Wind River Mountains is still sitting at 158% of a 30 year average, which is exactly double of what we had last year at this time. We’re expecting the flows to be relatively the same for the next week then picking up velocity as the forecasted temps increase later this week. We’re planning to start guiding mid June on the Upper reaches of the river in mid June, but please check back as we’ll be updating the conditions. We have access to 30 different sections to guide you on so lets get the party started! at Posted at 16:00h by Published by Rhett . 0 Comments . The latest Green River Fishing Report for Pinedale Wyoming for this week has been: Hit and Miss with LOTS of wind!. The streamer fishing has been great on the days the water has been clear and most of the ramps below the Hatchery are now open. The streamer pattern we’ve had the most consistent action on is the JJ’s special in a size 4. Expect the runoff to effect the fishing adversely as time goes on and the temps warm up. The current snowpack in the Wind River Mountains is still sitting at 158% of a 30 year average. Once the runoff gets underway we should have a better idea of when we’ll be getting out on the water to guide. The huge runoff should produce stellar fishing conditions throughout the entire season once the waters settle down. For an up to date report please call us @ 307.739.7020.
at Posted at 19:06h by Published by Rhett . 0 Comments . Our Pinedale Wyoming Fly Fishing Guides report that the Upper Green River is still froze up and the access is very tough still. The Green River above Fontenelle is blown out now and should clear up with the cold spell tomorrow. We’re guiding on the water below the Fontenelle Dam currently until the Bureau of Reclamation ups the flows to 4000 cfs, which they’re projected to do around the end of April. Please stay in touch @ 307.739.7020 to get the latest report as we’ll have boats out guiding. at Posted at 14:11h by Published by Rhett . 0 Comments . Reel Deal Anglers guides’ are getting very excited for another stellar season of guiding on the Green River with our professional fly fishing guides near Pinedale Wyoming. As of today the snowpack in the Winds, where the Green River originates is 161% of normal. With this being known we’re expecting a big runoff, which typically results in proving excellent fishing with amazing hatches. We are planning to start guiding below the Fontenelle Reservoir the first week of April. The flows will be higher than normal as the Bureau of Reclamation will be moving water downstream in anticipation of the big spring runoff. We will also be guiding on the upper Green River as the snow and ice melts. As soon as we get out on the water we will provide the latest reports. To book your trip please call us @ 307.739.7020.
at Posted at 12:39h by Published by Rhett . 0 Comments . The Green River is fishing very well and the hatches have been amazing every day. The Upper reaches have seen blankets of Grey Drakes every morning and lasting for 4-5 hours with fish sipping until mid afternoon. There’s also been a mahogany hatch as well before the drakes pop which get the fish up as well. The middle and lower reaches also have blankets of grey drakes along with pmds, yellow sallies, caddis and mahoganies, which are keeping the fish plenty active and feeding for the better part of the day. Look in the deeper runs towards mid day and that’s where we’re seeing the larger fish feeding. With all of the rain that we’ve seen in the Green River basin lately the water temperatures are optimal for dry fly fishing. at Posted at 13:36h by Published by Rhett . 0 Comments . The Green River has been a very consistent producer of lots of really nice fish eating dry flies. The fish are keyed in on these prolific hatches of Golden Stones and Grey Drakes every day. Before and after the bite stripping a streamer keeps you in the game as does dropping a soft hackle hares ear below the dry fly. As the forecasted temps rise to almost 90 this weekend the hatches will start earlier and wane about mid day. The area towards the headwaters will be the “place to be” with the hot temps over the weekend. Reel Deal Anglers guides on these waters that start at 8200ft at Green River Lakes and continue down to Seedskadee NWR. We have a new private, exclusive access between the Sommers public ramp and HWY 351 ramp, which gets you away from the crowded sections that have been getting lots of pressure the past few weeks. ESPECIALLY during the 4th of July week. We’re anticipating the flows to increase as the hot temps melt the remaining snow up in the high country of the Wind River Range. For more information about our trips or to get the latest report please call 307.739.7020.
at Posted at 22:50h by Published by Rhett . 0 Comments . The fishing has been getting better every day now that the water has settled and cleared up. The fish are definitly keyed in on the golden stones! We’ve seen lots of really nice sized trout eating the goldens on a consistent basis in the afternoons. Look for the action to start earlier next week as the temperatures rise again. Reel Deal Anglers is proud to announce our new private access to the Green River! Come see for yourself what it’s all about. A very select few ever get this kind of opportunity to fish without any people or pressure! The fish are slurping the stones!!! at Posted at 17:42h by Published by Rhett . 0 Comments . ******UPDATE******** As of this evening 6.7.13 the lower Green has blown out. The Upper Green near the lakes is clear and fishing good and below Fontenlle is ON FIRE!!! The Green River is still currently fishing well on dry flies. We’re still seeing a few Salmon flys along with PMD’s, Caddies and some Golden Stones. The water clarity today is a 7 out of 10, with 10 being crystal clear. If the water continues to rise and get a tint to it you can still catch fish on a nymph rig. Using a stone fly for the point fly and a san juan work for the trailing fly. The Green below Fontenelle is fishing AMAZING right now with the Cicadas! The fish are keyed in on them and this is the water where you’ve always got a legit shot at a 10 pounder!! !